CompTIA is the leading provider of vendor-neutral certifications in the world. It offers sixteen certification exams in PC support, networking, servers, training, Linux, security, IT sales, green IT, and more. CompTIA has been delivering certification exams for more than fifteen years, and is committed to continually improve the service provided to the industry. The Cloud Essentials exam covers six areas, each of which is defined and detailed throughout the course. They are the characteristics of cloud services from a business perspective, the business value offered by cloud computing, the technical perspectives involved in cloud computing, steps to successful adoption of cloud, impact and changes of cloud computing on IT service management, and the risk and consequences of cloud computing. Currently, there are 250,000 open IT jobs in the U.S and approximately 85% of people who hire give priority for IT certification. Currently, there are approximately more than 500 professionals across the globe who are certified in CompTIA Cloud Essentials. According to recent surveys by payscale.com, the median salary of a Cloud Computing professional is $100,000. Global cloud computing market is projected to reach $270 billion by 2020 which means wider job opportunities in the near future. Government and corporate environments moving to the cloud which makes it the most sought after career domain. Prerequisites of the course are sound knowledge in Network and Storage implementations, at least 24 to 36 months of work experience in IT networking, network storage, system administration, or data center administration, and familiarity with any major hypervisors for server virtualization. I appreciate the quality of learning material of Simplilearn. My experience in dealing with support team has been excellent. All-in-all, I feel Simplilearn is real value for money for professional IT education. Thank you Simplilearn! Simplilearn justifies their name “Learning Simplified” as they provide you with the right amount of study material with ample time and focused content so that you can understand the subject and can sail through the examination confidently. Their support team is also helpful even on Sundays. Thank you Simplilearn. The course was very informative for a newbie to cloud like me. It has a wide coverage. Very informative and to the point, courses are well designed to pick up the technology fast. The course is top rate. This was my first course on Simplilearn and going by the awesome learning experience, I'm taking two more. Love you guys. I have just completed this course and I am very happy with the training and help provided by Simplilearn. The sessions were very informative. Thank you Simplilearn! 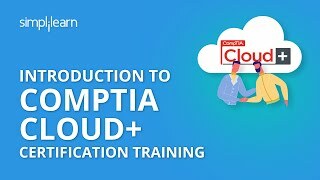 I think the course is doing an excellent job of giving a comprehensive understanding of each topic related to CompTIA Cloud. Kudos Simplilearn! You can enroll for the training online for India. Payments can be made using any of the following options and receipt of the same will be issued to the candidate automatically via email. # 53/1 C, Manoj Arcade, 24th Main, 2nd Sector, HSR Layout, Bangalore - 560102, Karnataka, India.